To me, there are many fun aspects of a wedding reception. One is the entrance by the bridal party and the bride and groom. My goal is for us to capture each part of the fun! Although cutting the cake for some might be mundane, for Suzanne and Sean, their cake cutting was definitely not normal. 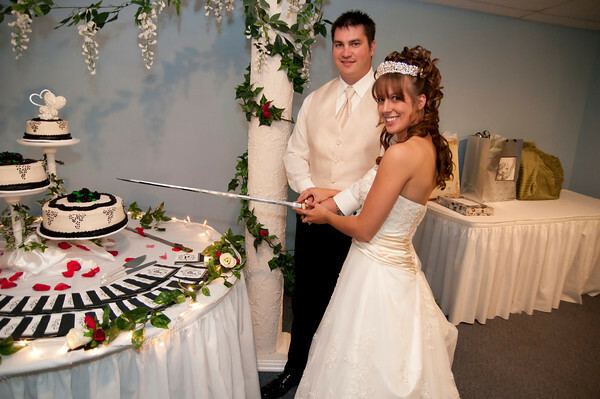 First, they used a beautiful military sword and had fun using it while cutting their cake. As they were getting ready to cut the cake, we were mentally preparing for what they might do after the cake was cut. As I was shooting, I kept watching for a distinctive and fun shot. 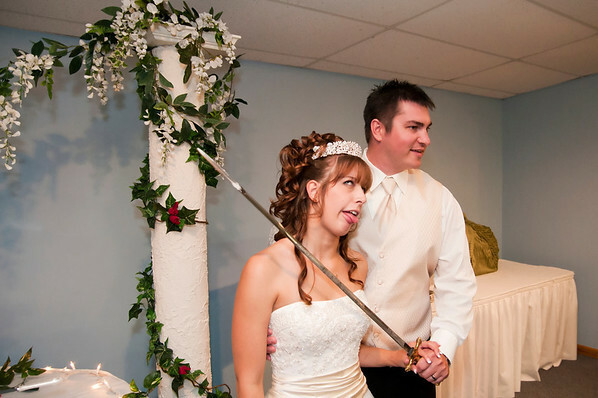 Sean was the first to act when he 'licked' the sword. Knowing the action rarely stops with one act of 'fun'. I continued to watch for the action through the lens and with my other eye. Then the fun expression took place and Suzanne made anyone watching her burst out in laughter. Tip: Even when all of the 'action' appears to be done, do not stop and look at the back of your camera (which most of us photographers tend to do). Keep watching the scene through the camera, and with your other eye (I shoot with my left eye). Normally, when least expected fun and funny activities take place. I have seen funny expressions from the bride to the groom. 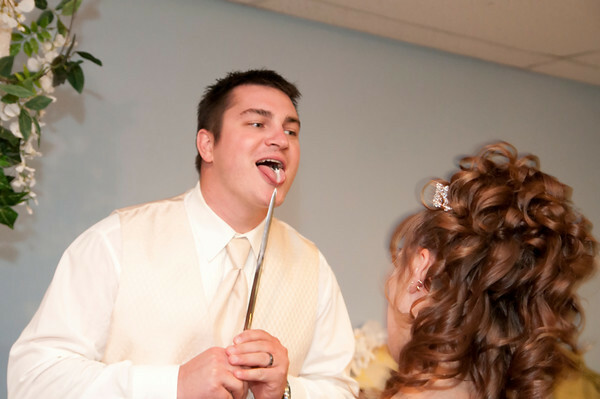 One that I will never forget is the look the bride gave to the groom as he prepared to 'smash' the cake in her face. The look stated; 'don't you dare smash that cake in my face.' He knew her look and did not smash the cake but gently place the piece of cake in her mouth and followed with a gentle kiss to the lips. On a different occasion, I remember where it appeared that the cake cutting would be uneventful. No cake smashing or anything special. Then the bride and groom looked at each other and burst out loud laughing as they both began to smash the cake and throw it at each other. No one within 6 feet of the couple were safe from cake spatter or flying cake. It was funny because of the way they did it and their looks. When all the cake was tossed about and the couple had cake all over them. They laughed and laughed as the guest stood there and enjoyed the fun. I don't think the people from the venue was happy since they had a serious mess to clean up but everyone was laughing and enjoyed themselves watching the newlyweds enjoy their first piece of cake together as a couple. Although there are many other important aspects of the wedding reception. Many times cutting the cake is one of the funniest parts of the reception. Technical info: Nikon D300/D300s, Tamron 17-50, Gary Fong Lightsphere to difuse the light from the SB800 mounted on the camera.